It's been absolutely ages since I wore a Lynnderella polish, and recently I grabbed for one of the most amazing polishes of it's time. Back in 2011 when this polish was released, there really wasn't anything else like it on the planet. With it's mix of over 100 different glitters, it was the glitter bomb to rule all other glitter bombs. It was one of the first Lynnderella polishes I ever owned and it holds a special place in my heart. 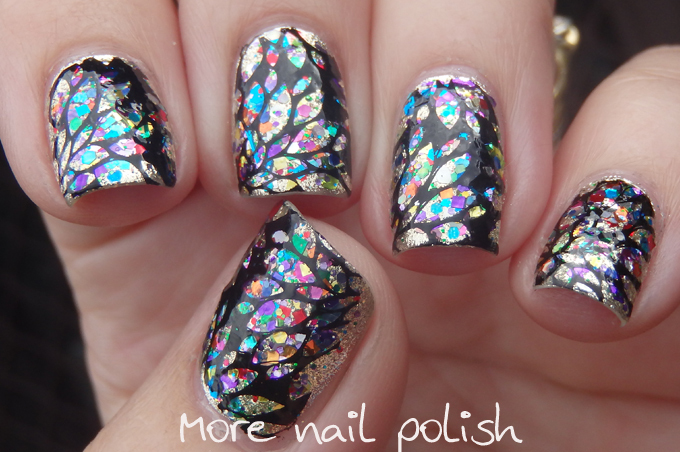 For this mani I wore The Glitter Crowd over Lacquersity Amazeballs and stamped in black with Messy Mansion plate MM20. Sadly these photos reflect the wet dreary day that I photographed them on, and not the bright blingy sparklies that they actually were. I also forgot to put a PVA peel off base coat on, so this was a biotch to remove! Wow! 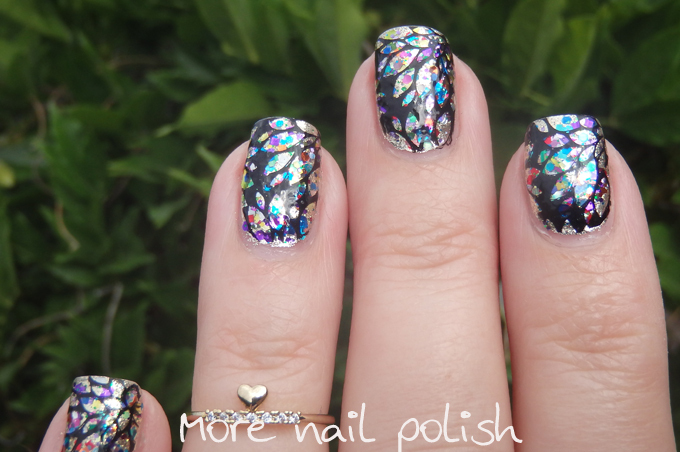 This mani is so eye catching! I like your choice to stamp over the glitter (atom) bomb with a black design. Interestingly, that sets off the glitter polish even more. I have a couple questions, if you don't mind. Did you topcoat the glitter polish so it was smooth to stamp over? And what black polish did you use for stamping? Thank you! Hi - yep I top coat the glitter polish so it is nice and smooth, and then do the stamping and with this one, I used my trusty Mundo de Unas stamping polishes from mexico - although I have just had some really great experiences with an Aussie indie brand of stamping polish, so stay tuned to read about that! Oh man, wow just wow. I love the glitter crowd! Its soooo shiney *swoons*. I use that image from mm with shineys too. 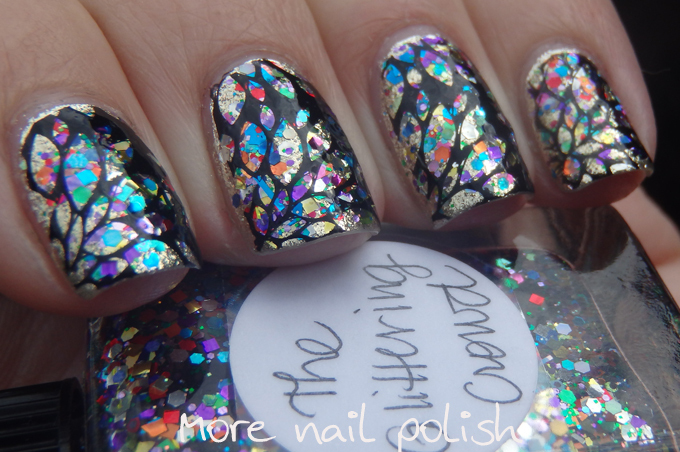 But the glitter crowd was around before I got the nail polish bug and its amazing! Gorgeous! I must pull out that image again!